Fork and Sta-Lok terminal in 316 stainless steel. Availabe in ether 1x19 or 7 strand wire types. Fork and fork in 316 stainless steel. 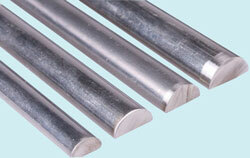 Made from 316 stainless steel, suitable for 4mm wire. 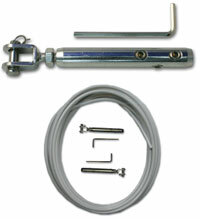 Supplied with Hex keys, 20mm adjustment. Use with the pelican hook, (Part No. 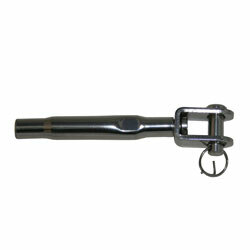 1081), for quick release gate. Guard rail kits Consist of 1 x Right hand adjuster, 1 x Left hand adjuster and 4mm stainless steel wire white plastic coated to 6mm. 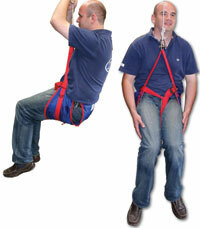 Most of us have spent hours leaning against a guard-rail whilst on watch! Uncomfortable after a whle isn't it? Well, this guardrail backrest is shaped to fit the contours of your back and relieve the discomfort. Made in UV stabilized white plastic, it is simply clip-on and off and is suitable for up to 6mm guardrail wire. Stainless steel eyes, swage studs and oval nuts to help create the perfect guard-rail set up.